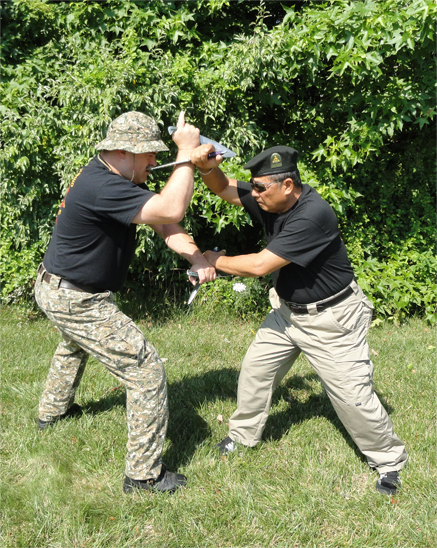 Pekiti-Tirsia is a unique Filipino Combat System that begins with Weaponry and then develops a very effective Hand To Hand Fighting known as Dumpag. 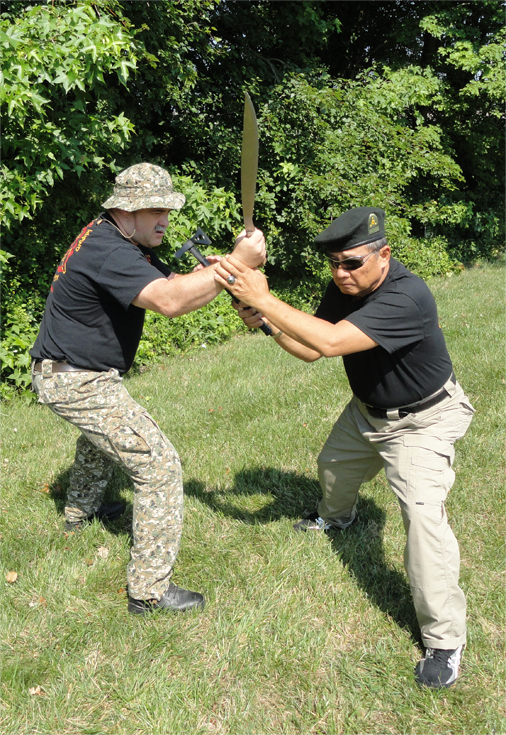 Starting first with a Short Sword (Like Talibong or Ginunting) or a Solo Baston (Single Stick) the student learns Footwork, Body Mechan-ics and the Ways Of Use of the Weapon. Then Instinct, Range and Timing are Mastered as both Offense and Counter Offense are learned together in a free flowing reactive manner. 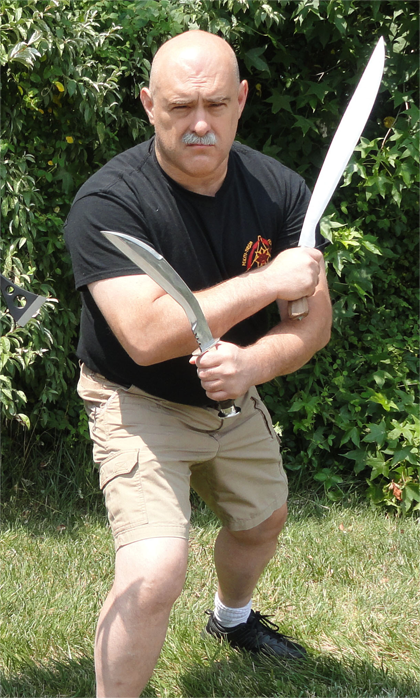 Pekiti-Tirsia works with Single Sword, Double Swords, Knife, Double Knife, Empty Hands (Dumpag), Sword & Knife, Long Sword, Spear, Throwing & Flexible Weapons And Firearms. 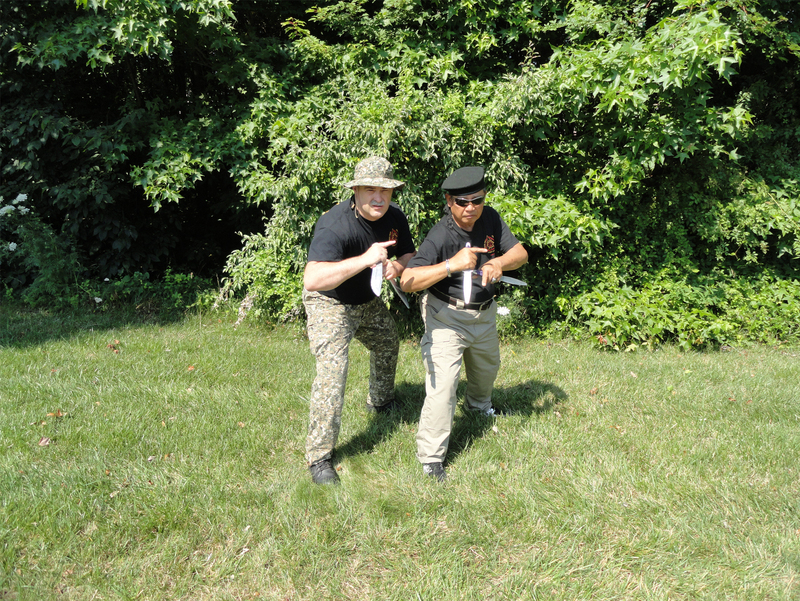 The Pekiti-Tirsia Warrior’s Corp in Newark, Delaware is led by Mandala Maginoo Allen J. Sachetti (A Direct Student Of Grand Tuhon Leo T. Gaje Jr. since 1991) who practices the art of Pekiti-Tirsia For one thing and one thing only: Performance within the stress of combat. At the Core of Mandala Sachetti’s training he develops 3 things: Your instinctive reactions in the heat of the attack, the Precison & Quality of your Technique and your Conditioning & Resolve to last. If you say the words “Attack”, “Counter” and “Finish” to different people you will get different perceptions, but the true essence of these words are something that you will realize in Mandala Sachetti’s Pekiti-Tirsia training. 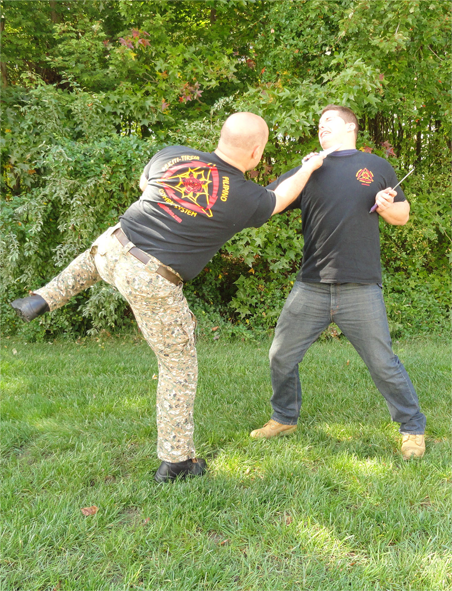 Whether you are working with Edged Weapons or Empty Hands your Attacks must deliver the most return for your investment. Counters must be instant and reactive to destroy attacks and True Finishers are just that, they end the attackers ability to be a threat. With Mandala Sachetti you will gain this ability against strikers, grap-plers, edged weapons, firearms and multiple attackers. Pekiti-Tirsia is a Malay Art from the Island of the Negros Occidential in the Philippines. Proven over centuries of actual warfare against the Chi-nese, Spainish, Americans and Japanese in WW2 it continues to be used by Elite Military Units around the world. Developed by the Tortal family of Negros it was first brought to the U.S. in the 1970’s by Grand Tuhon Leo T. Gaje Jr. where among his many ac-complishments he was a major contributer to the Police Training Film called “Surviving Edged Weapons”. Grand Tuhon Gaje returned to the Philippines in the early 90’s where he met Allen J. Sachetti in 1991 and took him on as an apprentice. Man-dala Sachetti lived in the Philippines until 1995 where he moved to Delaware. Frequently travel-ing back and forth to the Philippines Mandala Sachetti and Grand Tuhon Gaje continue their close friendship to this day. Imagine Movement Good Enough To Beat A Seasoned Boxer. A Base Good Enough To Stop A World Class Wrestler And A Ground Game That Literally Destroys Even The Best BJJ Practi-cioners. That Is Dumpag. A Different Kind Of Grappling That Destroys Even Solid Wresters By Executing Unique Mus-cle/Tendon & Limb Destructions With Effective Counters Into Compression Strikes & Finishers. Dumpag Is Not For Sport, It Is A True Battefield Art That Is Taught To US Special Forces And Other Elite Military Units Around The World. 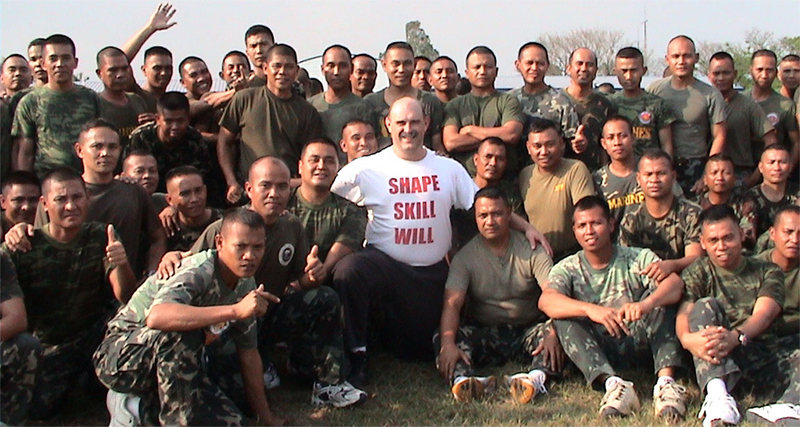 Seen above Mandala Sachetti is with the Filipino Force Recon Marines at Fort Bonifacio in Metro Manila where he was teaching them Pekiti-Tirsia Edged Weapons and Dumpag. 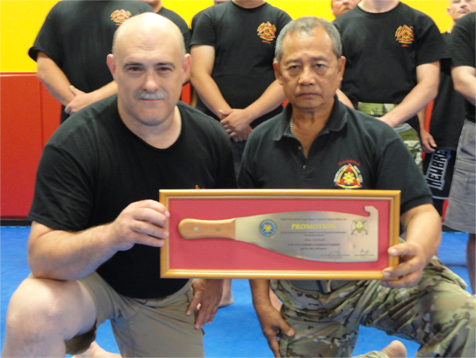 Seen to the left with Grand Tuhon Leo T. Gaje Jr. (on right) Mandala Allen J. Sachetti (on left) was promoted by Grand Tuhon because of his Dedication to the practice of the complete Pekiti-Tirsia System for Performance. Mandala Sachetti pursues an uncompromising course of technical excellence, physical & mental condiitioning for the instinctual, practi-cal application of Pekiti-Tirsia against real threats. This dedication is what has led him to create the Pekiti-Tirsia Warrior’s Corp for the true preservation of this way of life. So we do not practice Pekiti-Tirsia to just mem-orize forms or look pretty in a technical spar-ring demo. No, we practice it for the FIGHT!! For when the Fight comes all you have are your Instincts at the moment of the attack and your reactions at that moment must be right. Your technique must be excellent and your condi-tioning must be superb. If training in these things are of interest to you for the protection of your life and the lives of your family members, then come learn with Mandala Sachetti. Working with the Short Sword you will develop a far greater dexterity, speed and reaction time than start-ing with Empty Hands alone. You will also gain a Fluid Movement in both your Body Core & Footowrk with an increased sense of Range and Timing. This will make it very hard not only for armed attack-ers to slash or thrust you but also for empty handed attackers to strike, grab, clinch or shoot on you from all levels while you in turn can attack with Speed, Timing, Precision, Accuracy & Power. Talk to anyone who has been stabbed or slashed and they will ALL tell you the same thing: “I never saw the knife? ?” DO NOT BE THAT GUY!! You must be ready BEFORE you face someone with a knife. Once the blade is drawn and coming at you, it is like nothing else!! Don’t be like those idiots that say “Oh I’ll just use my gun”, Yeah? Do you carry it ALL the time? Do you practice to draw and fire it against someone GOOD who is coming at you FULL SPEED with a knife? What you need are Proper, Effective Blade Techniques that you can do instinctively with your Empty Hands as well as with Weapons. These Instincts alone are what will save your life. Because when the Blade is coming at you if you move wrong, YOU DIE. There are things you can do, but you must be taught properly and you must practice them. Having spent a large portion of my adult life training directly under Grand Tuhon Leo T. Gaje and having lived in the Philippines and spoken to relatives and direct witnesses of Conrado Tortal I can write with a degree of un-derstanding about Pekiti-Tirsia. Now I am in no way attempting to say any thing negative about the Doce Methodos as it is part of Pekiti-Tirsia and I have used it myself in fights. It just becomes obvious to anyone who practices the Doce Methodos that each part, of any element in it works for a specific “preset” attack or counter. You are practicing repetitions of “fixed” attacks and counters that always occur at the same range and timing. For example I love “Break In – Break Out” and it develops certain skills for certain attacks, but it only works if I get that specific attack launched at me in the range that the preset drill has trained me to react in. A good tool for sure, but I must be confronted by that attack at that range in order to use that tool. What if your opponent does not use that attack, mixes it with other attacks, fakes or diverts? That is why Grand Tuhon brought to us what his Grandfather called the “Tatlong Palapag” or Tri V which again in Grand Tuhon’s own words is: “more on building the house”, or for this analogy “making the fight”. The Tri V takes now all of the Footwork, Body Mehcanics, Attacks, Counters and Recounters you have learned and goes far beyond now into much more of a live action free flow. Here the student develops the Instincts, Movement, Range & Timing he needs to fire the weapons from “Multiple Loads” as he reacts and changes to a variety of different attacks in different situations. At the end of the day it is all about you gaining the ability to “React The Right Way” against whatever Attack, Fake, Pattern, Diversion, Counter or Recounter you experience with the most effective “Non Counterable” response. With the Tri V you will engage in more free flowing, random drills from the Long, Mid and Close Ranges as well as from different Depth (Standing, Kneeling, Sitting and Laying confrontations). Here the more advanced tech-niques really begin to grow as you experience greater variations of Attacks, Counters and Recounters. You will start to think less and become more “triggered” by the action of the attacker. This helps immeasurably before you spar and more so after you are sparring to improve any areas you have holes in. @Copyright January 2015 Skill Forge Inc.